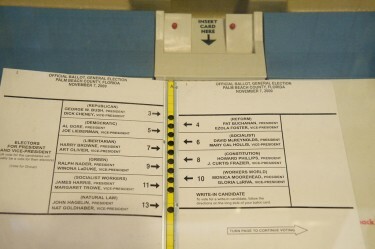 With the Florida presidential primary a day away, Joe Janes is recalling the time of butterfly ballots and “hanging chads” — the presidential election of 2000 — in the latest installment of his podcast series, Documents that Changed the World. In the podcasts, Janes, a professor in the UW Information School, explores the origin and often evolving meaning of historical documents, both famous and less known. To briefly review that election: Bill Clinton’s two presidential terms coming to their stormy end, Vice President Al Gore ran against George W. Bush, Texas and son of George H. W. Bush, our 41st president. The election was so close it hinged on the state of Florida. Recounts and litigation took the matter to the U.S. Supreme Court, which on Dec. 12 — more than a month after the national election — decided in favor of Bush. Gore had received more votes nationwide, but it was Bush who moved into the White House. In his podcast, Janes reintroduces us to Theresa LePore, the longtime elections supervisor in Palm Beach County, Florida, who designed the controversial ballot. 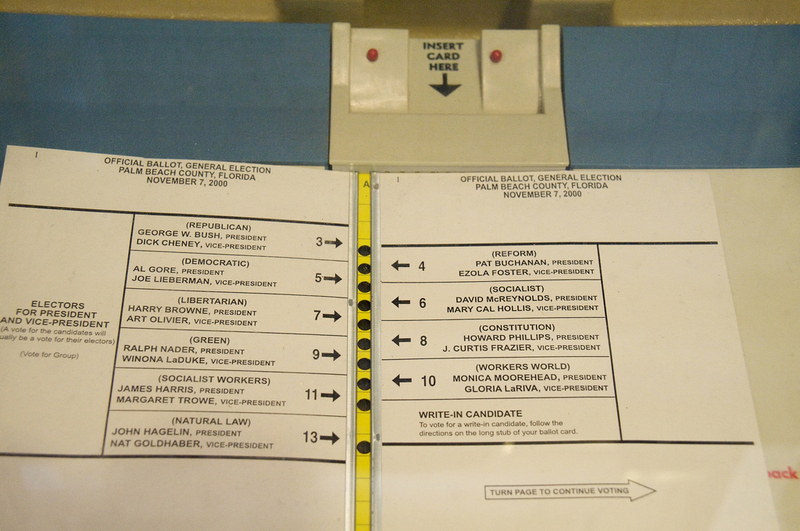 LePore’s good intentions toward seniors led her to increase the font size of the candidates’ names, thus spreading them across two pages of the Votomatic punch-card ballot instructions. “In her desire for readability, she sacrificed — almost everyone believes inadvertently — another key design principle: usability,” Janes says in the podcast. Subsequent analysis would suggest that thousands of people may have mistakenly voted for ultra-conservative Pat Buchanan due to the ballot confusion. Things, as perhaps you remember, devolved from there. Soon the mechanics of paper hole-punching — and “chads,” the bits left over afterward — became national news. Photos of elections officials inspecting ballots with magnifying glasses hit front pages everywhere (one pair of which, Janes notes, is now in the Smithsonian Institution). All America suddenly learned about hanging chads as well as dangling ones, dimpled ones, and even pierced, pregnant or swinging ones. Janes feels it appropriate to give the long-since-retired LePore the last word. Someone asked her, “Who do you believe won Florida?” That is, who was the rightful winner of the 2000 American presidential election? Listen to the podcast for her answer. For more about this or any of the Documents that Changed the World podcasts, contact Janes at jwj@uw.edu. All the podcasts are available online at the iSchool website, and on iTunes, where the series has more than 250,000 downloads.